On October 25, 2015, a news article in China Daily mentioned about introduction of third-generation supersonic trainer aircraft which has been introduced to the People's Liberation Army Air Force's flight schools－a move experts said will shorten pilots' training time and prepare them for advanced fighter jets. 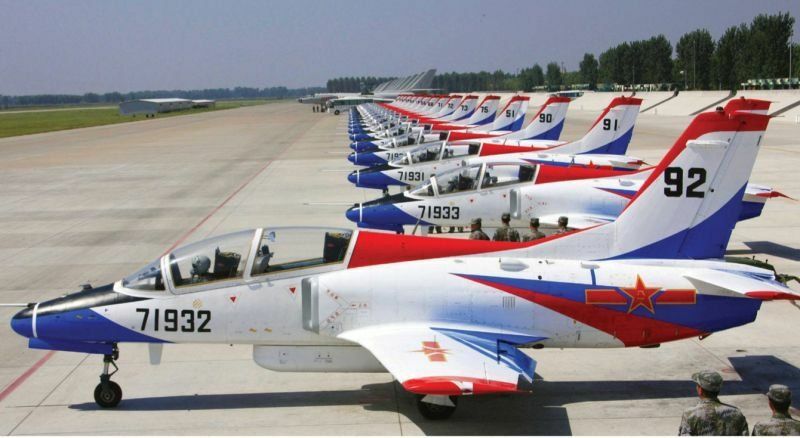 It also mentioned that PLA Air Force Aviation University deployed an undisclosed number of JL-9 Mountain Eagle two-seater trainer jets this month and has started to use them to train students, PLA Daily reported. The JL-9 made its maiden flight on December 13, 2003, only two years after the start of the project, making it the shortest development time for an aircraft in Chinese aviation history, while successfully keeping costs down. In June 2005, Chinese newspapers stated that the JL-9 would be part of the People's Liberation Army's eleventh five-year procurement plan. With all of the progress that's made in China's military aviation industry, the progress amongst advanced jet trainers have been rather slow, with Hongdu's products L-15/JL-10 and CJ-7 being the slowest and most frustrating. Guizhou and Hongdu both unveiled their AJT projects and had maiden flight around the middle of last decade. At the time, GAIC started the JL-9 project earlier and also had a simpler design, so was expected to finish quickly. Hongdu was more complex as a project with more advanced layout, higher specifications and powerful turbofan engine. Recent news from Guizhou that they are producing 3 types of AJTs: JJ-7A, JL-9 and JL-9G. Now, it’s quite interesting Chinese are still producing JJ-7A, but that may just indicate JL-9 series itself has taken longer than expected to be produced. As early as 2005, JL-9 was already undergoing testing in CFTE, but had to undergo some changes there after. It seemed like JJ-9 was delivered to FTTC for evaluation by the end of last decade. It seemed to have taken another 4 years after the tests and evaluations, for the first regiment to be delivered with JL-9 in 2013 even after achieving design certification in 2011. It's quite possible that more changes were made during this time based on issues found by FTTC. Since 2014, more JL-9 was delivered to both PLAAF and PLANAF, which would indicate the program is finally on track and have satisfied PLA requirements. At around the time CV-16 project was picking up speed, work for a naval trainer also started with JL-9G. It's unclear to me at this point if this variant is only aimed for naval aviation since tail hook is no longer installed. 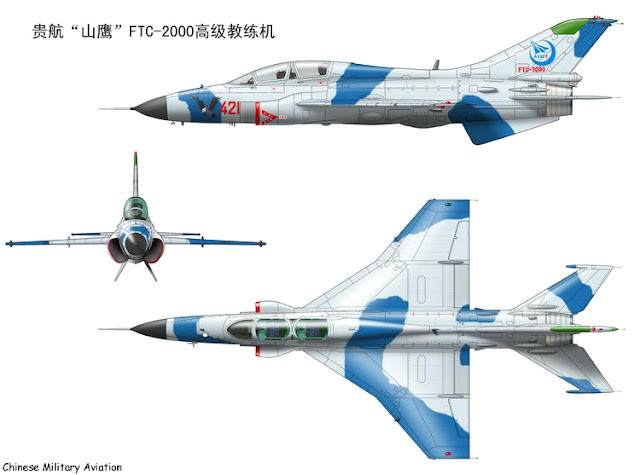 It's possible to imagine the proposed FTC-2000G design could bring in sales in numerous countries that are currently using J-7s and K-8s. 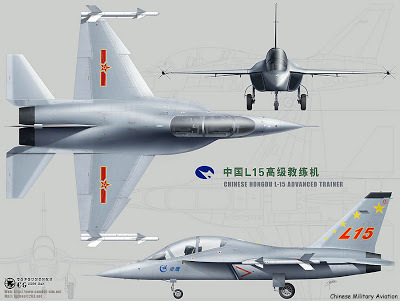 So while if we would place GAIC below other major AVIC1 design bureaus like CAC and SAC, it has still managed to develop an effective aircraft. On June 10, 2011, images of the PLANAF version of the JL-9 were revealed for the first time on Chinese state television. Several improvements were made to allow JL-9G to handle the greater stress and higher takeoff/landing requirements of naval aviation. At the moment, it has only entered service with PLANAF. Based on the greater payload of JL-9G vs. JJ-9, it seems like an aircraft that could also be adapted for light attack roles. It is a very low cost platform ($8.5 million each based on recent Chinese reports) and also extremely cheap to operate even compared to other AJTs. Hongdu is a different story. 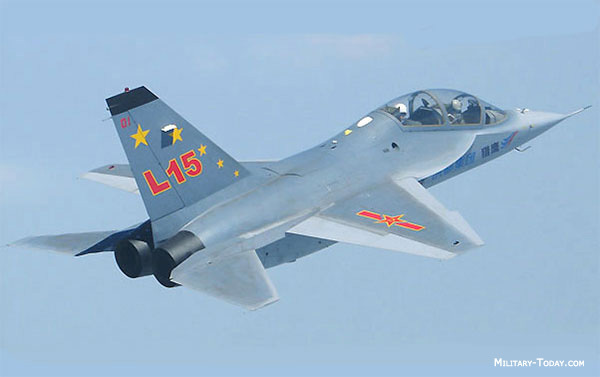 It has been over 10 years since L-15 was displayed in the 2004 Zhuhai air show and almost 9 years since it made its maiden flight in March 2006. To this day, it still has yet to join service with PLAAF. Through much of this time, only 4 flying prototypes were produced. If it was not for the steady cash flow of K-8 series, it would be hard to see how this company could really survive the lack of progress in its next major project. The interesting part is that Hongdu did get order for 6 L-15s from Zambia in 2012 and 3 L-15s recently did test flights since the turn of New Year. It’s quite possible that they will all be delivered to Zambia in the first half of this year. There were also reports that Venezuela ordered 24 L-15s. Similar to the K-8 project, L-15 will most likely be delivered for export before even getting evaluated by PLA. 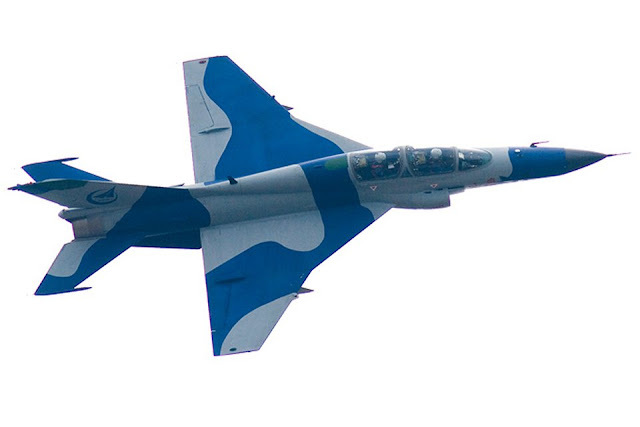 JL-10, which is the Chinese version of L-15 AJT, had its maiden flight in 2013. Apparently, a small batch of JL-10 will be produced and delivered to FTTC this year for trial and evaluation. Only after that and possible more modifications will JL-10 join service with Also, there is always the question of engine. JL-8 did not join service with PLA until the domestic WS-11 engine available. It's quite possible that will also be the case with JL-10. As shown in the JJ-9 project, it took several year of trial and evaluation along with changes before it went into full rate production. If that happens, one can expect JL-10 to join service after the first J-20 regiment gets formed. By then, the domestic Minshan engine might be ready for JL-10 project.It indeed speaks for Hongdu's ability as a design bureau that an AJT takes this long to get developed for PLAAF, but they do seem to be really good at selling their product. The K-8 project is still selling well after 300 export and 400 domestic order. L-15/JL-10 program can certainly follow K-8's path, because it is a fairly advanced AJT design that could also be adapted for other roles. China has finally moved on from JJ-7 series of advanced jet trainers. Even so, JL-10 project is still a couple of years away from really joining service, but sooner a large proportion of PLAF/PLANAF new pilots will operate third-generation J-10s, J-11s and JH-7s as soon as they join combat units. An advanced trainer aircraft was needed badly to connect flight students with available inventory of Chinese fighter jets. Typically a fighter student take a lot of time to learn and practice in JJ-7s, but ultimately prove to be useless because the third-generation aircraft they will eventually fly have different takeoff and landing procedures. So, Introduction JL-9 is one of the important first steps to bridge the gaps in the training and provide a good transition towards the 5th generation fighter jet that China is developing with keeping future in mind.